This article was originally published on Brisbane Times. If you're enjoying the #30before30 challenge, why not consider donating a few dollars via the secure PayPal link in my sidebar? All donations will be split 50/50 between the Australian Red Cross and Brisbane Arts Theatre. Thank you! We exchanged pleasantries, and looked for a suitable dingy cafe, full of cigarette smoke and despair, in which to speak in hushed tones about the art of Texas Hold ‘Em. Sadly, dingy cigarette-smoke-and-despair-filled cafes are rather rare in the Queen Street Mall these days, so we settled for a few tables under the harsh fluorescents at the Hungry Jack’s. "Chris" and "James". I'm the one with the cards. ﻿The RCC is a mixed bunch of ne’er-do-wells and mods chasing the dream. “James” won enough one grimy evening on the Gold Coast to pay his yearly TAFE tuition fees in one hit. “Pete” is thinking about changing sides and becoming a dealer to better study human nature at the table. “Jess” is a pocket rocket who can turn a split in the hole into a decent stack of chips. And “Chris” is point man for smooth dressing and attitude tips. (There’s also “Troy”, “Richard” and an interesting character called “Chiv” whom we lost early in the night to the roulette wheel and a couple of vodka Redbulls). My training session lasted an hour. I knew the basics of Texas Hold ‘Em: the flop, the turn, the river etc – but the RCC paced me through such key topics as positioning, bet ranges, card combinations and tells. “Pete” wrote me tips on a napkin. I focused my brain hard and absorbed as much as I could. My goal was simple – to slap $100 on the table and see if I could walk away with more. The RCC told me how I should act at the table, and how I should expect others to act. They quizzed me on the rankings of hands. As usual, I forgot the flush. With a final, jovial reminder from “James” to “have fun”, we left Hungry Jack’s and made our way to Treasury. I’d chosen a corporate look, feminine but no-nonsense. I was hoping to portray a sort of James Bond air of mystique, but that was undermined by my blouse’s propensity to pop open at the top hook. A bit less Daniel Craig and a bit more Mike Myers, sadly. Dame Fortune was on our side and a new cheap table ($2 small blind; $4 big blind) opened up minutes after registering our names at the poker lounge. I put down my $100 and received a rather smallish pile of red-and-white chips. “Chris” sat to the right of the dealer, “James” to his right, and me to the right again. 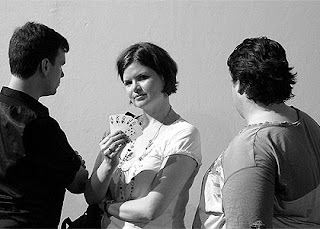 The other seven players were casino randoms: a Chinese girl to the dealer’s left, a dark goateed young man in a white hoody, a couple of blokes in flanno shirts, a blonde goateed man we would come to refer to as “the ATM”, a bloke who looked like Sartre, and a nervous geeky young guy wearing dark glasses for poker cred. I’d been told to not bet for at least one, if not more rounds, to get the feel of the table. Just fold, fold, fold. But on the second go, I got an ace in the hole, so decided to enter the race. I chickened out when serious betting started, though, and so it continued for a few hands – I'd stick my toe in the water, then beat a frightened retreat when the big guns came out. Hoody seemed very keen to make an impression; Glasses to my right was up to the task, while Sartre and the flanno twins played more cautiously. China was full of guile, an expert in not being noticed, then - BAM! - she'd pull out two kings and the whole table would sigh. The ATM was an ATM. Unfortunately my steady-as-she-goes playing style and tendency to check and call, rather than make a bold betting move resulted in my already small stack withering away fast. My first victory came about an hour into play. I pulled a pair of eights in the hole, then another 8 came up in the flop. Bang. I went o in heavy against Hoody. The cocky youngster tried to stare me out, but I stayed calm and matched him. He looked genuinely shocked when I flipped the trip. Boom, $60 pot. Very good timing too, as I was down to about $30 by that point. My cool calm exterior lasted about as long as it took the dealer to stack the winning chips; at that point I let out a “woohoo!” Homer Simpson would have been proud of. “James” and “Chris” laughed and shook their heads. My second win came when I casually bet on a Queen in the pocket, then increase it when another Queen comes out on the turn. When the time comes to show, I feel pretty happy about my pair. But as I reveal my cards there's an admiring “flush!” from the group. I smiled knowingly, then whisper to “James” – I didn’t even notice the flush, I was betting on the freaking Queens! Lucky break on that one. I had a third win - again on triple 8 - and while I can’t for the life of me remember what hand I had, I do know I won a fourth. At one point I got back up to $97, before the inevitable downward spiral. Sometime around half past midnight, two hours after I sat down at the table, I finally go ALL IN on a hand. It's against Hoody, who’d become a nemesis of sorts sitting across the table. I had an 8 in my hand, and 8s had been lucky for me so far. Another 8 came out on the flop, as well as a 10. For some reason I thought my other pocket card is a 10. Brilliant. Two pair. I went in relatively hard, about a $15 raise. The turn came out. Can’t remember what it was. Didn’t matter. I kept going. Another $10. The river came out. A 7. Bonza. I raised. Hoody raised further. I went ALL IN. I flipped my cards, and in the split second they were turning I remembered I didn’t have a 10. I had a King. I only had one pair. My brain rallied “That’s OK, maybe you’ll beat him on a king high.” But then Hoody flipped. He had 8s and 7s. SEVENS! He’d scored a second pair only on the river! Foolish me hadn’t bet strongly early enough to scare him off. The bugger stayed around and Dame Fortune smiled on him. I pondered, for a moment, as the dealer gathered up my last chips and passed them over to Hoody, about whether I should pop to the ATM and grab another $100. To be honest, I was really enjoying myself. This was fun, and the money didn’t seem so consequential when it took the form of chips. And then I looked at "The ATM". He had to be at least $400 down, with no sign of stopping. I realised I had lost the money I was prepared to lose, and should retire from the table looking tense but dignified. If I learn nothing else from the music of Kenny Rogers, at least I’ve learnt when to walk away. Postscript: “James” finished with $320 profit; “Chris” with $175. “Pete” joined in and was up $50 by night’s end. “Jess” lost her loose change at blackjack. “Troy” and “Richard” simply watched like wise gargoyles. “Chiv” was last seen dancing to the steel drum busker out front.